The Adena Mound was located in Chillicothe at the base of the hill where Governor Thomas Worthington built his home. "Adena" is the name Worthington gave to his estate. The Adena culture (800 B.C. to 1 A.D.) of pre-contact Native American people -- an archaeological grouping referring to the peoples who produced cultural artifacts during this time -- is named for the Adena Mound. The Adena Mound was nearly 27 feet tall and 140 feet in diameter. In 1901, William C. Mills excavated the Adena Mound. At the time, Mills was the Curator of Archaeology of the Ohio Historical Society (now the Ohio History Connection). Mills discovered a number of artifacts in the mound. He and his team of workers found copper bracelets and rings, slate gorgets, spear points made from Flint Ridge flint, and many bone and shell beads. The most remarkable artifact found in the Adena Mound was the Adena effigy pipe. 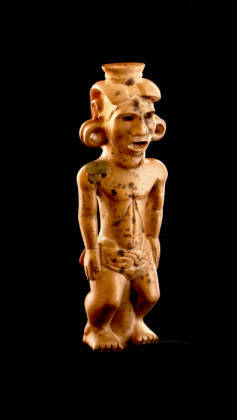 It is a tubular smoking pipe carved in the shape of a man wearing a decorated loincloth and a feather bustle. The Adena pipe is made of catlinite or pipestone.